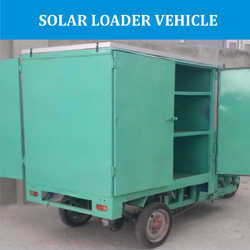 Leading Manufacturer of solar auto rickshaw, solar rickshaw, electric loader vehicle, solar auto rickshaws, solar operated loader vehicle and electric auto rickshaw from Greater Noida. 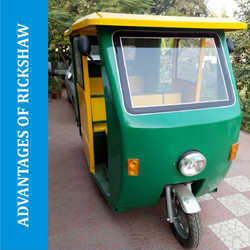 We are instrumental in offering Solar Auto Rickshaws to our clients. 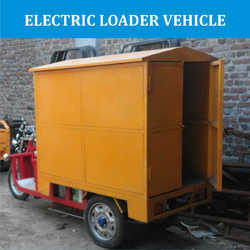 It has high efficiency and saves a lot of time and energy as it runs by solar energy. The batteries are installed that has good life and charged by solar energy. They are whether proof and are known for saving a lot of time. These are manufactured in adherence to set industrial standard of quality and are supplied to clients at leading market prices in stipulated time frame. 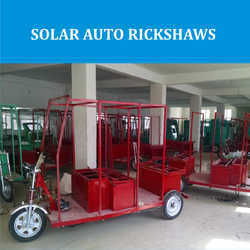 • Our “Solar Assembly Unit” assists in generating additional income for the rickshaw owner. the battery being fully discharged. : up to 750 kg. : for staring, accelerating, decelerating, driving and stoping. : for service and parking. switches provided on the dash board. • movable mobile shops, daily needs products. panel of 48V 300W and 48V 100 AH Batteries. body is made on our Rotomoulding Machine. operating in Hot and Cold Climates. • There is hardly any maintenance required except wear and tear of Tyres and Batteries. 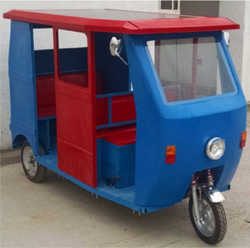 • We are also manufacturing E-Rickshaws to give choice to our Customers. 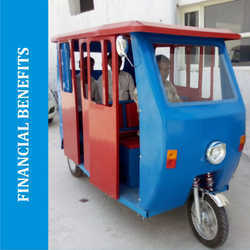 • The mileage covered by the Solar Powered Vehicle is more than 50% against electric vehicle. • With solar system the batteries are charged continuously and it gets automatically cut-off once the batteries are full, this in process prolongs the life of batteries. • Replacement cost of the batteries is prolonged. • Under the standard sunshine, the batteries can be charged in a short period of time, which saves on electricity costs through mains. • There is no pollution or discharge by using solar powered vehicles, which is a big contributor for world environmental protection. • Very high efficiency solar cells are used in the solar panels used for converting sunshine into electricity. • These vehicles are hybrid in nature. 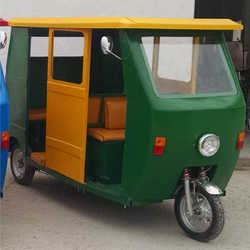 there are two sources of power :- Mains Operated: a) The Batteries can be charged like any other electric vehicle in case of extreme rain or very cloudy weather. b) By solar power fitted at home. For staring, accelerating, decelerating, driving and stoping. Red, Green, Yelow and Blue. Also available as per demand of Customer. IMPORTANT INFORMATION: Pallet load capacity is linked to your product bulk density, package dimensions, layout, and MHE & Rack design. 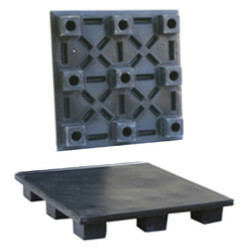 Racking load depends on the capacity of the pallet. It is highest when the entire length of the pallet rests on the rack. Looking for Solar Auto Division ?